⇒ NavigateHome Science Instrument – – Wind Sensor (WS) – – Ground Temperature Sensor (GTS) – – Air Temperature Sensor (ATS) – – Relative Humidity Sensor (RHS) – – Ultraviolet Sensor (UVS) – – Pressure Sensor (PS) – – Linear Wind Tunnel – – Black Body Source – – Mars Simulation Chamber Operations – Human team – Institutions and Organizations – Articles – Chapters in books – Congress – Technical documentation – Latest News – REMS in Media – Fotos – – Images of campaigns – – Images of instrument – – Gallery from Mars – Videos – Divulgation videos Curiosity – Discover REMS – Magazines – Education – Why Mars? 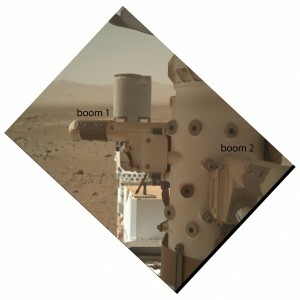 The picture shows the two booms of REMS on the mast of rover Curiosity (Image Credit: NASA/JPL-Caltech). NASA’s Mars rover Curiosity acquired this image using its Mars Hand Lens Imager (MAHLI), located on the turret at the end of the rover’s robotic arm, on January 28, 2014, Sol 526 of the Mars Science Laboratory Mission, at 13:56:06 UTC. What does this measurement mean? Just copy this piece of code and paste it in your website. Copyright by Centro de Astrobiología (CSIC-INTA) - 2013, data from MSL/REMS project.